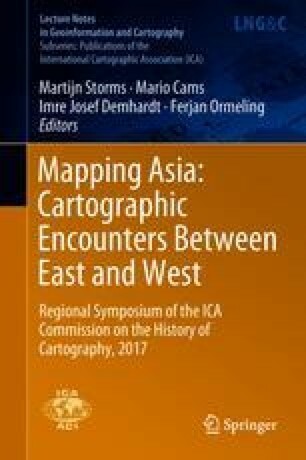 The existence of diverse local toponyms in the Dutch East Indies encouraged Dutch cartographers to adapt their writing system. The use of diacritics was the solution chosen to keep the original pronunciation of the toponyms and thus save their original meaning. Diacritics were applied and functioned differently throughout the archipelago, depending on the complexity of the local languages. Java, Aceh and Nias are used as examples here to show how diacritics were added to toponyms in different ways. The maps used for this research belong to the historical map collection of the Royal Tropical Institute and have been downloaded from the Leiden University Libraries website. All maps were published during the Dutch colonial period in the East Indies in the 19th and 20th centuries. Not all maps in that collection were consulted, but only those that show areas with toponyms having special characters or phonemes. For this reason, maps from the Javanese, Acehnese and Nias language areas were chosen, as these languages have the strongest character variation compared to other parts of the East Indies. Our research shows that in the locations observed, the addition of diacritics to the toponyms was not always done in a consistent way. Either pronunciation shifts among native speakers or misspellings during the romanization process could be the reason why the toponyms are pronounced differently from their original pronunciation today. Diacritics were applied to the official maps of the Dutch East Indies between the 1900s and the 1920s, before they were gradually phased out in the 1930s. Moreover, after the Perfected Spelling System of the Indonesian language ( Bahasa Indonesia) was established in 1972, the use of diacritic signs was extremely limited and even could not be found anymore in the daily standard Indonesian language, including the present official maps. Further regulation on toponyms is the Minister of Home Affairs Decree No. 39/2008 concerning General Guide for Topographical Names Standardization. It is mentioned on Article 7(2) that diacritics are not allowed for all romanized Indonesian toponyms. This affected non-native speakers, and even native speakers who no longer able to pronounce the toponyms properly and these are now threatened with the loss of their original meaning. We would like to thank the Leiden University Library for the opportunity and permission to access their collection of maps, the Ministry of Home Affairs of the Republic of Indonesia for their permission to present this idea, Universitas Gadjah Mada for providing education in cartography and toponymy, all respondents from Java, Nias, and Aceh for their valuable support to this research. Our precious appreciation is dedicated to Mr. Hanafi, Prof. Multamia Lauder and her husband for the discussion about language in Indonesia and we would like to express our sincere gratitude to Prof. F. J. Ormeling for his concern regarding the publication of our research.